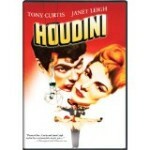 Houdini, starring Tony Curtis, and his wife, Janet Leigh, is one of my top ten favorite movies of all time. Yes, the same parents to Jamie Lee Curtis, who would later make a name for herself with her debut at the age of 19, in the movie Halloween. It may be a bit Hollywoodified, but it still retains its charm. I particularly love the straitjacket escape scene. The place where this takes place is just loaded by visual eye candy. If you have ever seen this movie, you will know just what I am talking about. It is just loaded with vintage Halloween decorations! Black cats, witches, jack-o-lanterns, you name it! The movie features a lot of his magic tricks and escapes, including the Chinese Water Torture Cell. The movie was made in 1953, by Paramount Pictures. It was directed by George Marshall, and produced by George Pal. I can’t honestly tell you how many times I have seen the movie, Houdini, starring Tony Curtis. I know it has been more than a dozen times. The first time I saw it was the night my favorite uncle died in a car crash back in 1968, on the late show. The hospital had phoned my mother during the seance scene, of all places. I do have this movie in my personal collection. I pull it out from time to time when I want to see a great old movie that is a lot of fun. Not only that but every now and then I just love a trip down memory lane looking at those vintage Halloween decorations-my kind of eye candy! If you want to watch an enjoyable and fun movie that the whole family can watch, I recommend this one! If you enjoyed this article, please like or share below. Thank you! I love this movie too. You and I must be about the same age. I find everything to do with Houdini fascinating. Very interesting subject, thanks for posting. I like all things Houdini, too, Tod. I have several books in my library about him. I have always been fascinated by Houdini, and am a magician myself. I own this movie, as well as many, many books on the subject of magic. Thank you for posting this article! I’m glad you enjoyed the article, Marquis! I have a lot of books on the subject of magic and magicians as well. It has fascinated me since I was a kid.